ESPN.com is doing a series on the “Greatest Coaches in NFL History” as part of a commemoration of the 100th anniversary of Vince Lombardi’s birthday. A group of their best NFL people (one of whom, deservedly, is Bill Polian) comprises the voting panel, and checking in as the 20th-Greatest in their opinion is Tony Dungy. First off, I am glad Tony is honored. Secondly, I wish he were rated higher. That is my brain and heart speaking. Tony was my seventh head coach as a Colts publicist. The wonder of that number – seven – was in evidence every day around him. Tony is one of the few people whose reality far exceeds the image. He does it daily, honestly and easily. 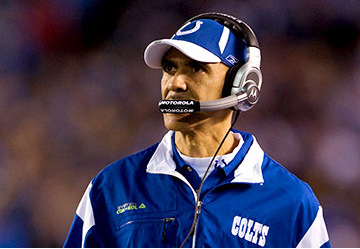 Passed over multiple times in head coaching interviews, Dungy joined Tampa Bay in 1996 and led the Buccaneers to the playoffs four times, once to the NFC Championship game. He was dismissed in 2001 after consecutive first-round playoff losses, and Jim Irsay hired Tony to be our head coach quickly after that. Tony’s power and grace could be felt immediately as he entered the building. The smart suit and gold cross on the label were indicators of the man. His first team address came in normal conversational tone, and he let the players know he never would speak at any higher volume. He never did. Once when a fracas erupted on the practice field, Tony told players that while he could not prevent fighting in that venue that he did control who played in games. There were no more incidents. Tony could convey more with less than anyone I’ve seen, and his ability to draw things from within was a special gift. On more than one occasion, opposing players expressed their regard for him as a coach and person (NFL Films once captured Randy Moss, then with New England, doing so in a very genuine way). 148 victories ranked 19th-best in NFL history. After a particularly galling 27-point loss at Jacksonville in 2006 where the team allowed 375 rushing yards, Tony stood firmly (even proactively going on network television) to convey we had the players and scheme to win. Seven games later, the Colts were World Champions and he was hoisting the Lombardi Trophy. Without Tony’s leadership, it would not have happened. From the Chuck Noll influence (with perhaps more than a bit of Tom Moore), Dungy left a great coaching tree, two of whom on it having Colts connections – Jim Caldwell and Leslie Frazier. There were so many private moments I had with Tony in seven (there’s that number again) years that will last a lifetime. Maybe my favorite came after the 2007 season when we had a playoff loss at San Diego and there were rumors he would retire to go about his life’s work. It was back in Indianapolis and he was heading out of the building to return home to meet with his family. In passing as he was about to reach the door, I stopped Tony to convey what I could in words about what he meant to me in case the next time I saw him would be in a non-working capacity. He offered thanks and a hug. Then, conveying a message without a word – a wink. I knew he was coming back. We smiled and I told no one the secret. The way Tony molded players and affected lives is something that spans far beyond any numbers he achieved. It is a gift that keeps on giving, for me and I bet many others. I will make sure to see the coaches the ESPN panel picks ahead of Tony. I guarantee there will be no finer man. It won’t even be close.